Frustration might will continue, but the series on frustration is over. Below is a map of the posts. Dealing with frustration rightly really is an ongoing journey (hopefully one we are growing in) and that’s why I mapped it out like a narrative. You can click on any part to jump directly to that particular post. And here’s a large version. We will probably not see our worlds completely changed as we wish. 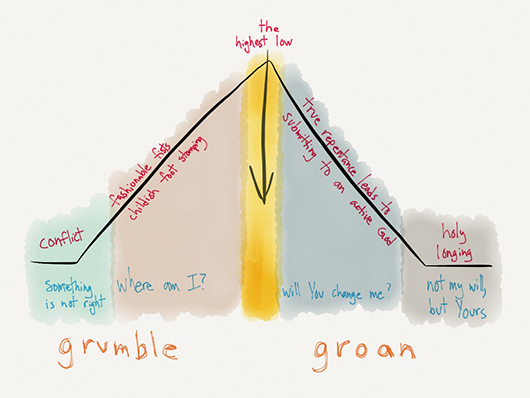 For those who cling to their own wants with an iron grip, that leads to grumbling. For those who hope in spite of the darkness, that leads to groaning, and our sound joins with creation and Christ on the cross, hoping in the day where all things will be made new. There were some main points that I was thinking about and being convicted of. Here are some of those thoughts. Jesus putting us in our rightful place. The disciples are maybe thinking too much of themselves in these verses. They are excited, yes, as anyone would be, but something in them prompted Jesus to remind them of who He really is. He is the one who threw Satan out of heaven and our supposedly great things we do are still lame and small and half-hearted. We can’t do anything, even the slightest good thing without God moving us to do it. By the way, that goes for any good thing from anyone, if you are a believer or not. This brings up another point, that Jesus seeks relationships from us, not works. He doesn’t need our works, they’re just gifts he gives us for our sake. He wants us. “Nevertheless, do not rejoice in this, that the spirits are subject to you, but rejoice that your names are written in heaven.” Don’t rejoice in what you think is an awesome thing that you did, but first rejoice in the fact that He has brought you to Him- because that is the incredible thing. Then moving to the Matthew verses, I couldn’t help but think how the church really does believe that we are better than those who do not believe, or at least those who have outward signs of unbelief. We want to feel comfortable and those who have disease and affliction and those who are harassed and helpless aren’t good enough to hear our message of hope. As a professor of mine once said, you don’t have to have messy lives, just don’t love anybody. We want squeaky clean and sanitation. We don’t want to get on our hands and knees with the dirt and the grime because we truly think we’re better than that. Rarely have I seen the church believe that the message of Jesus is for everyone. The message of Jesus- who He is and what He’s done is not for people who smoke, drink, curse, or hang out in bars. We believe that salvation is for those who are good. As much as we say “It’s not what you do, it’s who you know!” we actually believe and live the opposite. And this is where Jesus comes to rearrange us. In these sections of Luke and Matthew, we learn the correct relationships and learn more about our Savior. It’s not us over them or even Jesus over us and them, His desire is to be with us. And them. He calls us brother. The incredible thing of the incarnation was that He became like us, lowly humans, to take us out of darkness and into morning. To create something beautiful out of our cacophony. And this is the model we are supposed to emulate. We should embrace foolishness and dirtiness, not to be foolish or dirty in themselves, but recognize that we are foolish and dirty people and Jesus had compassion on us. And those that we don’t think deserving of the message of life are diseased, afflicted, harassed and helpless, needing the hope just as much as we do. And maybe that’s what we’re so afraid of, that we really see ourselves in the gospel-untouchables. It brings out the fact that we really don’t deserve life (because we always think we do) and that we can’t do anything to gain it (because we always think we do). And Jesus comes beside us, with all of our shortcomings and failings and calls us one of His own.